I have a passion for health, fitness, an impacting people’s lives. Decades of experience creating unique, engaging websites can now power your business. We are the premier agency for gym and athlete branding and marketing. As an online community for health and fitness, WeRCrossFit breaks the status quo. Built in 2018, it stands as the home for users supporting each other in their fitness journeys. The community has forums and member groups to foster sharing. Later ventures built CrossFit news, blogging, training, and diet resources. In 2019, WeRCrossFit became a go-to source for information about the CrossFit Open.. Check back for the CLBFitness re-launch in mid-2019. I approached Camille Leblanc-Bazinet in 2018 about her growing business. As a CrossFit Games champion and Fittest Woman on Earth, she big plans. The re-build of CLBFitness focused on her love of people. An exciting design made sure you couldn't miss her site. Search engine optimization made sure Google was happy, too. With a thorough engagement strategy, subscribers feel Camille's investment in their success. SolarWinds solutions are rooted in our deep connection to their user base in the THWACK® online community. More than 150,000 members are there to solve problems, share technology and best practices, and directly contribute to our product development process. 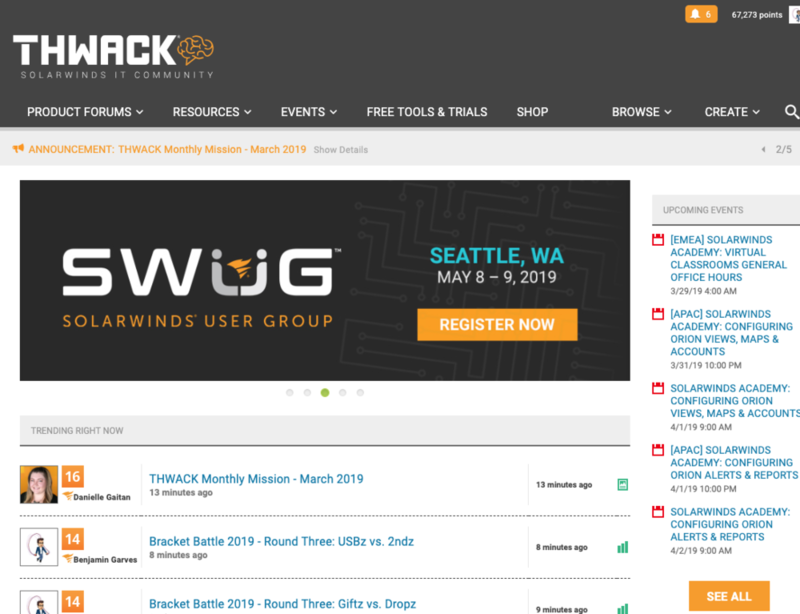 Fitting under the marketing umbrella of the SolarWinds organization, I oversee a $700,000+ annual program budget for an online IT infrastructure social community called THWACK. With over 130,000 users and 2,000,000 annual unique visits, my community is the gold standard in the IT space and for online communities as a whole. Cross-functional manager, simultaneously overseeing multiple software development products, projects, and teams. Initially Benefitfocus operated on in a waterfall release format and I joined a pilot team that introduced an agile scrum environment and built it out company-wide. Clients ranged in size and scope, up to SaaS projects and product customizations for the likes of Google and other high-profile (NDA-protected organizations of 10,000+ employees) organizations. In this role I also assumed responsibility as the business analyst in charge of building a scalable operation and modeling resource demand, capacity, and utilization. Directly reporting to me were a team of project managers and their individual teams, including one scrum team I led as a scrum master. At Appen, I worked remotely while managing multiple international field teams for high-tech companies in content analytics. In the last six months I have grown the scope of my current project from an incubator pilot of $20,000 to its current budget of $3.5 million dollars annually. Global clients are confidential, however do include two top tier social networks, a leader in e-commerce, and one of the world's most popular search engines. In these projects, I have ramped resources in over 15 markets and languages, managing production of team rosters ranging in size up to 200 autonomous consultants. This includes training and delegation of pertinent tasks to associates, QAs, leads, auditors, and admins. My work at Appen was as a member of a new projects division, focusing on implementation of projects and pilots for new clients. An additional responsibility undertaken more recently was as a production point of contact for two functional tool/app releases, including development of a training and documentation toolkit, and documenting user feedback for use with developer teams to enhance tool functionality and envision possibilities for future iterations. In this role I had dual responsibilities between front office management and non-partisan auditor of hotel transactions, including management of payroll and scheduling, acting as the standing liaison and HR conflict mediator between staff and management when the situation arises, and executing staffing and hiring decisions for the front office - things like writing and posting job listings, interviewing candidates, calling references, and new-hire paperwork. I also trained and educated new employees for both leadership and non-leadership positions within the property. On-call status for any emergencies within the hotel regarding technical and operational situations. Generate policy and implement systems regarding the day-to-day operation of the hotel and the functions of the front desk to build more staff-friendly, guest-friendly and time efficient processes. Contact me for a free walkthrough of your site and your goals.